Is this normal for a larger ship to have a lower detectability range by sea than a smaller one? I just find it odd, unless I'm missing something.. By the way both ship captains have concealment expert skill. IF the ATL would be in the same tier as the Mino then the Mino would have the worst concealment of the two in tier 10. 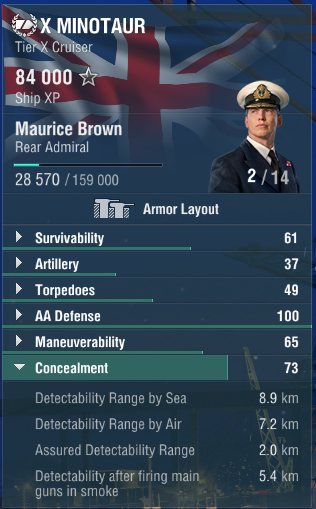 IF the Mino was in tier 7 like the ATL, then the Mino's concealment would be about 9.7 which is still worst then the ATL at tier 7. According to my uneducated guess, the ATL would win IF the Mino goes down to tier 7 or even if it goes (heaven forbids) up to tier 10. Remember WOWS is an arcade game although some parts are right, it will tweak other parts to suit the ship for its tier, cheers ! Minotaur has a base concealment of 11.52 km. Atlanta has a base concealment of 10.98 km. So in this case the smaller ship has a smaller concealment. I believe it also has to do with the height of the ship anyway. Don't know whether WG is consistent with this or mainly focus on balance. There are Battleships in this game that are stealthier than Cruisers. 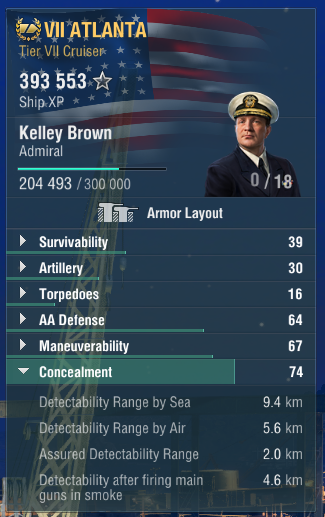 Concealment is whatever WG wants it to be. When the game launched, there was more logic applied to concealment ranges. It was like this for a long time. The stealthiest BB for years was North Carolina, and she was the epitome of the Stealth Build BB. Then the RN BBs came out. I expect the Italian BB Line will eventually have some Pasta Ninjas also. The Italian ships we have in general feature stealth, even the BBs. You can creep up in Caesar to about 12km of an unsuspecting Cruiser and unload. 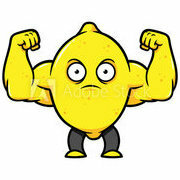 They'll never know what hit them. The NC is the WoWs equivalent of a Klingon Bird of Prey. You engage the cloaking device, decloak at 12 km and raise forward deflectors, then unload into your targets vulnerable nether regions. It’s armored enough and has good enough secondaries that it’s first surprise strike will give it enoughnadvantage to beat almost anything. This is arcade battles not realistic sim.